Here’s another reason to love golden retrievers! 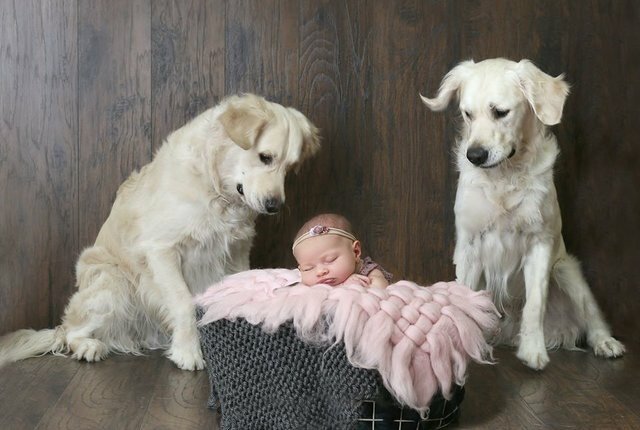 Even when our pups are naughty, they’re still incredibly cute, and for the Cardinal family, the fur babies even got the human baby in on the heist. Chris and Nina Cardinal, honorary dad and mom to 1 year old Chloe and golden retrievers Colby and Bleu, were astounded one day when they found Chloe wandering their hallway when they had just put her to bed with the door to her room closed, and that she couldn’t reach the door knob yet! In order to get to the bottom of the mystery, the parents decided to turn to their security camera; and weren’t quite sure how to react to what they found. Peep the video from the link above, and you’ll see what we mean! Turns out, the dogs knew that Chloe knew where the kibble and dog treats were stashed, but she just needed a little coaxing before they got her out her crib. One of the dogs knew how to work a door knob, then they both barged in and woke up, and for extra measure, goaded her out the crib by stealing her stuffed toy. “Lately she’s been dropping food for them from their bin,” said Chris to Pop Sugar. Ugh! But we can’t help it: even when they’re naughty boys, they’re still good boys. Why don’t you take a peep at these even gooder boiz (and girls!) from our favorite account We Rate Dogs for a good end to your work week?